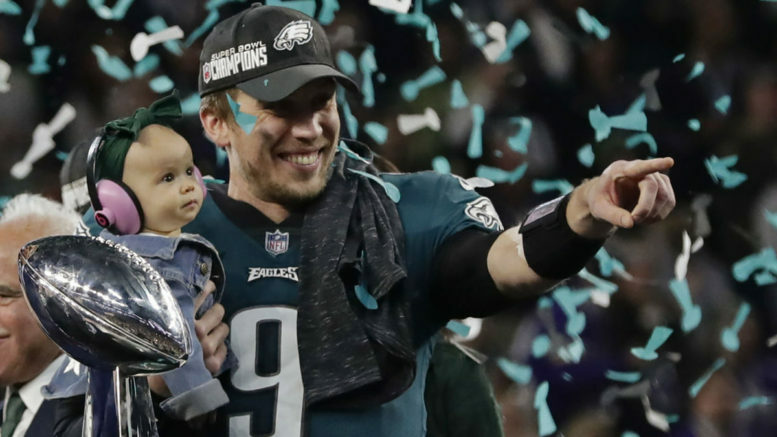 Nick Foles was named Super Bowl MVP after throwing three touchdown passes and catching another in the Eagles' 41-33 upset win over the Patriots in Super Bowl LII. Apparently, I was three years off. It wasn’t 2004. It was actually 2001. Call it a space odyssey if you want. It was weird. Nick Foles hoisting the Lombardi trophy as Tom Brady dejectedly jogs off the US Bank Stadium field? Was this some sort of practical joke? I mentioned that I would gladly sacrifice my championship game/series picks streak to see the Patriots lose (hey, I did pick the Eagles to cover at least). It turns out that symmetry was a theme in Super Bowl LII. It just wasn’t the kind I thought we’d have. You see, this year’s Eagles did a few things that we haven’t seen in a while. Specifically, since the 2001 New England Patriots. If this is indeed the birth of a new dynasty in the NFL, it is entirely fitting that it unfolded just like this. The 2017 Eagles finished with a losing record (7-9) last season. The last team to do that and then win a Super Bowl? The 2001 Patriots. The 2017 Eagles won with a backup quarterback. The last team to do that? The 2001 Patriots. The underdog Eagles beat a Patriots team with a long-established dynasty and a future Hall of Fame quarterback, just as those pesky Pats did 16 years ago against Kurt Warner and the Greatest Show on Turf, the St. Louis Rams. Rather than go away after their stunning (at the time) victory, the Patriots emerged as the greatest dynasty the sport has seen, at least in the Super Bowl era. Does that mean the Eagles are all set up to win four more championships in the next decade-and-a-half? Let’s not get ahead of ourselves. This is a team built for success in the years to come, especially when you consider they’ve already secured one Super Bowl win without their franchise quarterback, Carson Wentz. They have one of the game’s premier coaching staffs, led by sophomore head coach Doug Pederson. The only person to beat Bill Belichick as both a quarterback and a coach, Pederson has suddenly emerged as a strong contender for the “next best coach in the NFL” label after Belichick. And who knows? Maybe one day, Pederson will challenge Belichick for all-time great status. Again, let’s not get too ahead of ourselves. Much like the 2001 Patriots did, the Eagles took control of the game early, leading almost the entire game before dropping behind by a point early in the fourth quarter. In Super Bowl XXXVI, the Pats gave up an early field goal to the Rams before surging ahead, 17-3. They would squander that lead, just like the Eagles saw a 12-point lead dissipate as many fans undoubtedly started thinking back to last year’s historic meltdown by the Atlanta Falcons. But like those 2001 Patriots, the Eagles rallied on a drive by their unheralded backup, and went ahead to stay. If this is, in fact, the end, or at least the twilight, of this Patriots reign, it will have unfolded in fitting fashion. There was no Tuck Rule to galvanize the Eagles’ playoff run, no miracle we can look back on say that “this play spurned a dynasty.” Philadelphia was an underdog in all three playoff victories, which is unprecedented for a top seed. The 2001 Patriots were favored in their first playoff game, but double-digit underdogs in their next two. Both teams squeaked by in the divisional round before more convincing victories in the championship game. Coaching was such a big part of both teams’ title runs, and the prevailing thought is that the Eagles may have unearthed a real gem in the 50-year-old Pederson. What is remarkable is that a team could win a Super Bowl against a potent offense in a game in which its defense did not force a single punt (that has to be an all-time first in a Super Bowl, doesn’t it?). This game had shades of that 2003 Colts-Chiefs playoff duel in which neither team punted at frosty Arrowhead Stadium. But the most yards ever combined in a single game in the history of professional football? Who in their right mind thought that the Eagles would be the victors in such a game? One notable difference between the 2017 Eagles and 2001 Patriots is that more people saw this Eagles team coming. Not many predicted a Super Bowl victory, but I had them pegged as the eventual top seed in the NFC this year. You could see this team was ready to breakout after a year in which they were highly competitive in just about every game, and finished with wins over eventual playoff teams in the Giants and Cowboys. That 2001 Patriots team was actually considered by some, like Mel Kiper, to be bottom-feeders in 2001. If I’m not mistaken, Kiper actually pondered whether the Patriots could go 0-16 that year. The Patriots finished the 2001 with six straight wins, but looked like anything but a powerhouse. The Eagles were the clear-cut favorites until Wentz tore his ACL in Week 14. Still, this was a refreshing change of pace from recent years. Foles finally provided Eli Manning (who, by the way, was in attendance at Super Bowl LII) company in the elite class of quarterbacks to beat the Patriots in a Super Bowl. For whatever reason, the Patriots have struggled both against NFC East teams and as the designated home team in the Super Bowl. New England is 1-3 against the NFC East in the Super Bowl and 4-0 against the other three conferences, is 2-3 as the home team, compared to 3-0 as the road team, and of course, 0-3 when Eli Manning is in attendance. The Patriots lost their first Super Bowl while wearing white, also denting a dominant run by white-clad team in Super Bowls, as the team donning the “roadies” had won 12 of the previous 13 Super Bowls. It won’t make watching last year’s Falcons debacle any easier, but will at least give Patriot-haters everywhere something to savor in addition to Super Bowls XLII and XLVI. Just when it looked like the Patriots would have another miracle, double-digit comeback in store, the Eagles kept the pedal to the medal, refusing to succumb to the same self-inflicted wounds as teams like the Falcons, Jaguars, and Seahawks have in recent years. As Steve Young noted on NFL PrimeTime after the game, it feels like you have to beat the Patriots three times to actually beat them. Philly refused to be intimidated when it could have folded. I can recall John Madden advising Belichick and offensive coordinator Charlie Weis to play conservative with Brady and take the Rams to overtime in Super Bowl XXXVI. Instead, they let Brady sling it, and he drove the Patriots downfield for the winning field goal. It was a similar story with Pederson and Foles, as the coach entrusted his “backup” QB to convert a critical fourth-down pass to keep the eventual game-winning drive alive. The Eagles may have also provided a sort of blueprint for future teams to follow against the mighty Pats. Sure, we already knew you had to have a good coach, quarterback, and defense (duh) to upend New England. But really, it’s more than that. It’s an attitude adjustment. It’s going for it because you believe in your team, and calling a trick play because you’ve spotted a weak spot in the defense, not because you think you’re outsmarting Belichick in the process. It’s sticking with what’s working, rather than, say, running the ball down New England’s throat and then deciding to call about a seven-step drop pass on 3rd-and-1 when a yard would virtually ice your first championship. It’s playing fundamentally sound football rather than, say, forcing yourself out of field goal range with penalties when three points would seal the game. Somewhere, Dan Quinn was watching this game with a notepad in hand, jotting down observations and saying things out loud to himself like, “Ohhh, DON’T go backwards on drives,” and, “Right, RUN the ball when you have the lead against the Patriots.” Speaking of Quinn, he must be some sort of good luck charm for the Patriots. In the past 11 seasons, the Patriots have appeared in five Super Bowls, going 2-3 in those games. In games against Quinn-coached teams, New England is 2-0. Against the Giants and Eagles, the Patriots are 0-3. Poor Quinn — Tom Coughlin and Doug Pederson, he is not. But let’s not get off track here. Congratulations to the Eagles on their first Super Bowl win (in fairness, it is actually the franchise’s fourth NFL title). They not only won America’s hearts by taking down the Patriots, but have paved the way for their own potential run of greatness. If the story feels familiar, it should. Be the first to comment on "Breaking News: Philadelphia Eagles Read My Last Article, Say ‘We’ll Show You Some Symmetry’"